Wake Up Call is a next-generation sci-fi stealth-action shooter with a heavy emphasis on choice-driven gameplay and story in a unique and atmospheric post-apocalyptic world. Wake Up Call tells the story of Kyle Rogers, an ex-special ops soldier who has been awoken after over 150 years of cryostasis sleep. The world went to hell while Kyle slept, and it has been transformed into an alien planet. Experience Kyle’s story through a visceral and intense true first person perspective that allows for heightened immersion and gameplay fluidity. Challenge yourself to beat the game’s smart AI that adds new levels of challenge to the stealth-action genre. And finally immerse yourself in a dynamic and choice-driven story-line that will have you on the edge of your seat until the very end. Wake Up Call will be one epic adventure that any and all sci-fi fans will need to experience. It's a shame you haven't curved the hand grip as I suggested to do in the comments section for the initial concept. Oh well, looks not bad either way. Well, if it seems better to do that, we may ask for the modeler who makes this to do that. Glad that you commented, I am sure I probably saw it and considered the idea when you posted it on the other image. Anyways, thanks for commenting, we will of course consider all comments and love to see them from you guys out there. Trust me, this is only one of them. There will be at least one more, at least. Well, I anticipate multiple more pistols, but regardless, if you want to make one of these guns, feel free, just email it to me. Thanks! I notice that you only seem to be picking one gun of each category (pistol, assault rifle, etc...) I hope that you plan on having more one of each in the game. You certainly have plenty of great concept art for more weapons. We do, we just haven't concepted all of them yet. Each gun gets its own sheet, I guess I figured people would assume that this was only one of each type and there would be more. Well when you showed the concept sheets with all the different pistols, smgs, sniper rifles, and assault rifles I assumed you would be picking several guns from each sheet. But then I somehow got the idea later that you where just picking one. Anyway, glad I was wrong. Great concepts so far, can't wait to see where you go from here. 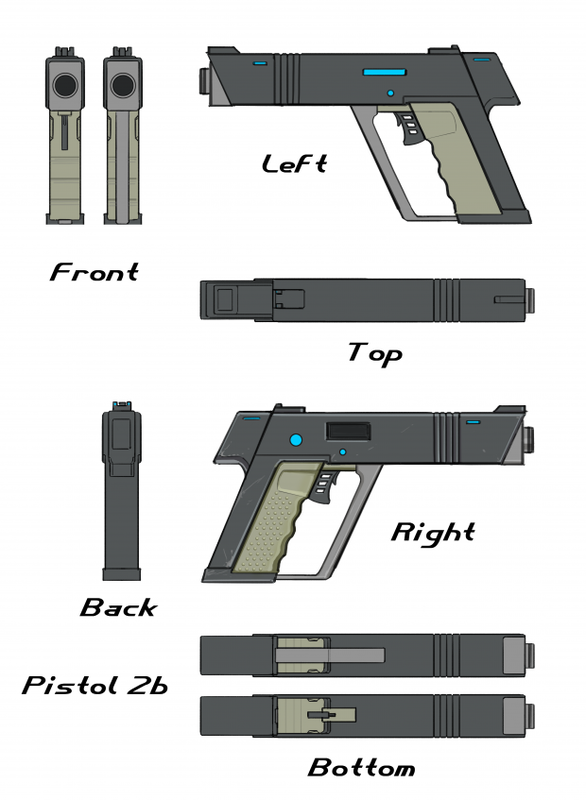 This is the final full concept sheet for one of the pistols in the game. This is the reference our modeler will use for the gun, and, as always, if you know a Weapon Modeler, send them our way please!